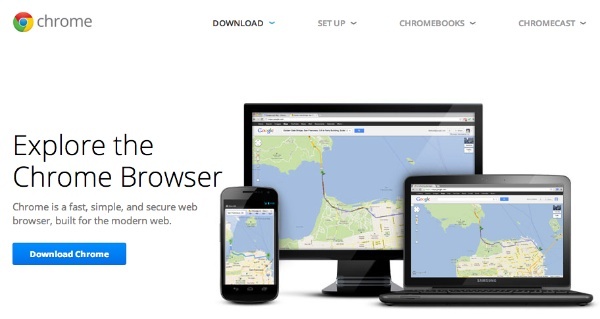 If you do not have the Google Chrome browser, you will need to download and install it. 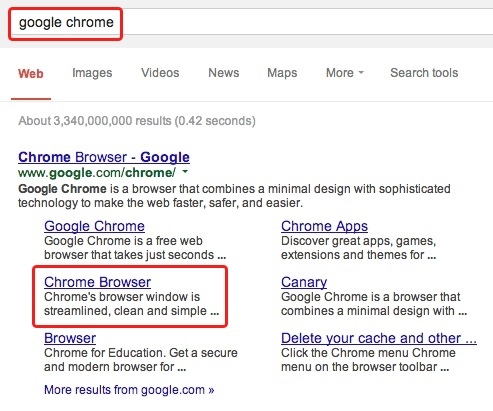 Type “Google Chrome” in Google, this will show you where to get the browser. You will see this page. Click “Download”. After Google Chrome is installed, locate the “Apps” button on the Browser’s tool bar and click it. You will see the default applications in Chrome. Click the “Store” application icon. 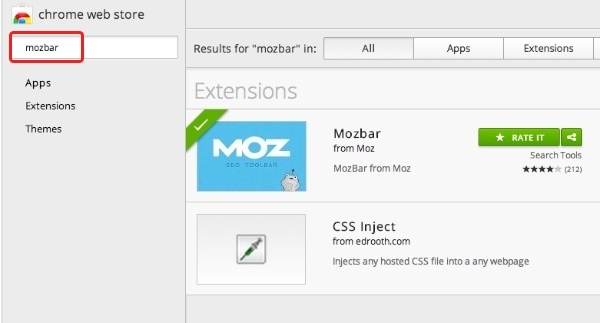 In the search area type “Mozbar” and click the button at the right to install the application. You will see at the top right of the Chrome Browser that a new blue square button with a “M” has appeared. 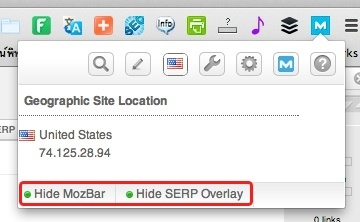 Click on that button and make sure that the 2 options “Hide MozBar” and “Hide SERP Overlay” are enable. The dots are Green. If later on you want to disable the MozBar tool, click on these 2 links. The dots will be red. Now that you have Google Chrome and the MozBar tool, go to Google.com and type your chosen keyword. The MozBar shows 2 important value for ranking well in Google. They are the Page Authority (PA) and the Domain Authority (DA) on a scale of “100”. In the image above PA= 46/100 and DA=77/100. In order to have a chance to rank your chosen keyword well, the results on the first page of Google have to have a PA inferior to “40”. It is best to have the DA value inferior to “40” as well but if the DA for your own site is superior to the value of your competition, you should be good. 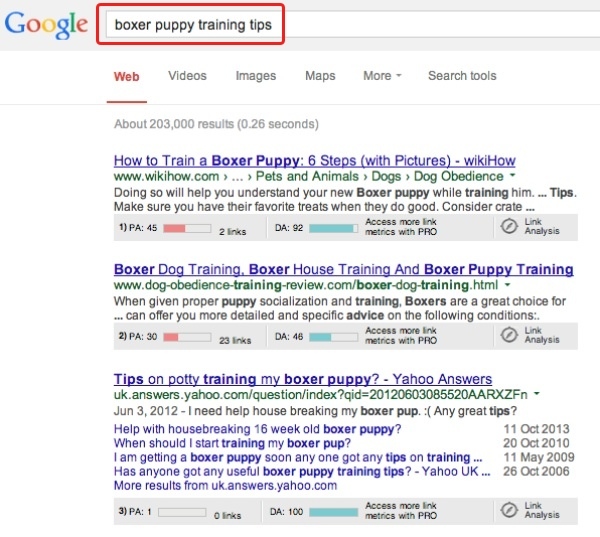 For this example I use “boxer puppy training tips” as the keyword and analyze what the MozBar is telling me. The first result has PA=45, which is a bit too high and DA=92, which is very high. You can also see that there are only 2 links for the page. It will be difficult to beat that first position without creating lots of back-links to your page. The second result has PA=30, perfect; DA=46, not very high. 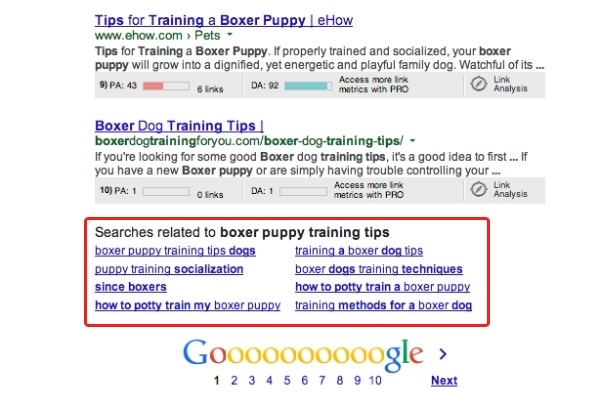 The keyword “boxer puppy training tips” is not in the title and this means that if your post has the keyword in the title and some back-links, getting position 2 is doable. The third result has PA=1 and DA=100. This page ranks only because of the domain authority. If your domain has some authority and the page too, you should be OK to beat that result. Now we have two Youtube videos, which usually rank very well with DA=100. The first one has a PA=48, which is a bit difficult to beat, but if you use the keyword in the title, it should be OK. The second video has PA=1, which is a bit weak. The keyword is in the title though. The sixth result has a PA=54 and a DA=46 and lots of links. It should be very tough to beat that one, but has you can see there are 5 sites that rank better. The page might not be optimized for the keyword or the content of average quality. The eighth result has PA=17 and DA=26. This is also very easy to beat. The ninth result has PA=43 and DA=9n. It should rank higher and I believe that the content might not be as good as the other eight sites. The tenth result has PA=1 and DA=1. It should not be on the first page of Google really… and it is very likely it will disappear when you publish your own post. This method of assessing the ranking of sites is not accurate at 100% because we do not know about the 200+ signals that Google uses for ranking sites. Nevertheless, it gives a pretty good idea if your chosen keyword can make it to the first page. If you see high PA all along the first page of Google, that would be better to choose another keyword. And you see that at the bottom of the page, Google is suggesting related keywords that you can investigate with the same method. A quick way to assess your possibilities of ranking your keyword on the first page of Google would be to add all the Page Authority (PA) values and see if the average is under “40”. This confirms that the keyword can rank easily. Page and Domain Authority do not suffice to have you rank on first page. In addition you need to use the keyword in your title and in the post. The article has to be of good quality and more than 500 words. 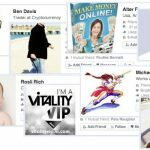 I hope this method on how to use the MozBar to rank better will help you.